1 b&w; image taken at Lone Pine, Calif. which is the nearest town to Manzanar concentration camp. 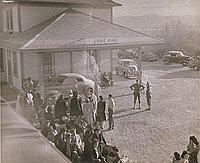 Men, women and children waiting with luggage and packages along an open dirt area near a train depot. Train cars along BL. 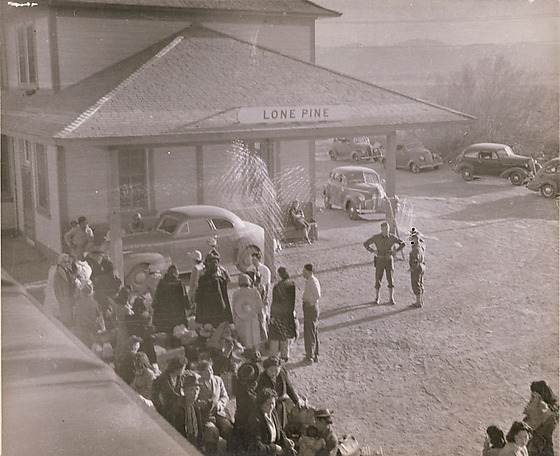 C is train depot, sign on top of roof reads: Lone Pine. Car parked in front of building; more cars parked along area to TR. Men in military uniforms stand together to R of people who are lined up near train.